Only a few more months before the much anticipated 2016 elections. Even so, the election period, which was supposed to start on February 9, has been moved earlier this year. The Commission on Elections (Comelec) has declared January 30 as the start of the election period. According to Section 22 of Republic Act No. 8436, the body has power to alter dates for certain pre-election acts. During this period, many acts are considered prohibited due to the close proximity of the election day. Government officials, as well as employees, are prohibited from suspending an elective official and transferring or moving of officers and employees in the civil service. 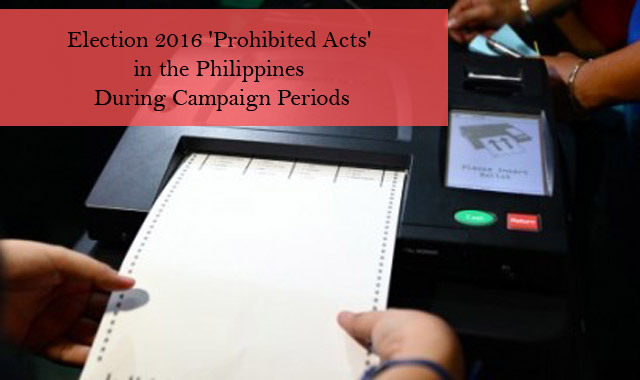 Violating the prohibitions might be a ground for disqualification if the offender is an election candidate. At the same time, the gun ban commences with the election period. This means that the bearing, carrying or transporting firearms or other deadly weapons, wheter licensed or not in public places would be an election offense. Violating such would be punished with imprisonment of not less than 1 year but not more than six years. Furthermore, Permits to Carry Firearms Outisde Recidence are also suspended. PTCFOR, Mission Orders, Letter Orders, and Acknowledgement Receipts previously issued are deemed ineffective, and without force and effect. Furthermore, various checkpoints are set all over the county for a visual search of vehicles. It is primarily set to confiscate firearms, but illegal drugs, endangered flora and fauna might also be seized.